And then she grabbed a red eye to head back to Miami to sail before flying on to the New York Yacht Club to accept one of the sport’s highest honors, the Rolex for the Yachtswoman of the Year. 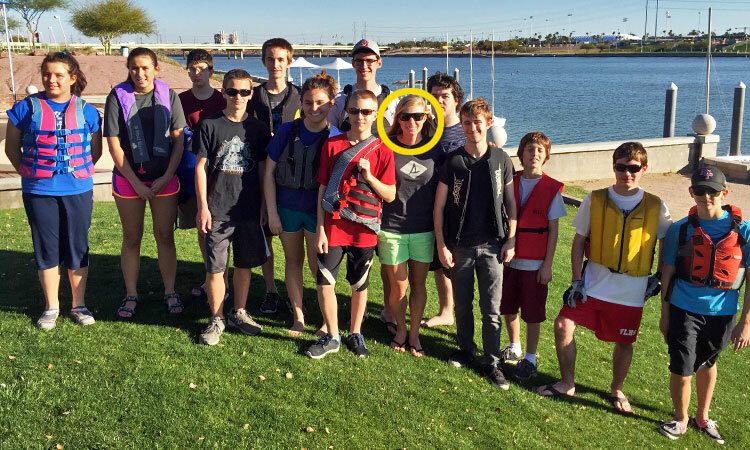 First Stephanie Roble flew into Phoenix and headed to Tempe Town Lake to talk with the ASF high school sailing class, looking only slightly older than her audience at 25, but bringing literally a world of sailing experience. She won the U.S. Women’s Match Racing Championship last year and placed third at the ISAF Women’s Match Racing World Championship. Based on her 2014 match racing results, she began the New Year as the top American match racer and is ranked number three in the world. Wow. What tips did she offer the high school kids? She suggested that they keep detailed notes on their sailing, tracking where they’d been, what the wind was, what they’d done to go fast, and so on. She said her notes kept her focused on going faster and performing even better. When she got to the packed AYC meeting that night at 7, some 100 people applauded as she offered detailed tactics for match racing, upwind and down, the “dial-up” at the start and moves that would help win. She spiced up the rundown with some astonishing videos, including a killer start sequence and a crushing crash. While we don’t match race at AYC, Stephanie suggested that knowing some match racing techniques can be a big help in fleet racing, too. Going head to head with a competitor? A match racing move could make the difference. Then she got on that red eye. Here’s a link to Stephanie’s website. And here’s a link to donations to her effort.